I know that you join me in looking forward to our 113th academic year as we turn our attention to the exciting future of Mount Carmel College of Nursing and our Alumni Relations activities. Additionally, we’re excited about our expanded Online Doctor of Nursing Practice program, entering its second year, which now includes the Certified Nurse-Midwife (CNM) for admission consideration. With the deadline for application set in August for the Spring 2017 cohort, we’re looking forward to seeing who among our alumni may be returning to advance in nursing practice as innovative leaders in today’s ever-changing healthcare environment. Take Your Life’s Calling to a Higher Level. 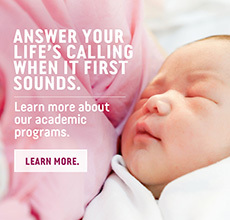 If you are an Advanced Practice Registered Nurse (APRN), Nurse Practitioner (NP), Certified Nurse-Midwife (CNM), Clinical Nurse Specialist (CNS), Nurse Executive (NEA-BC) or Advanced Public Health Nurse (APHN-BC) and are ready to take your career to new levels in nursing leadership, this is the program for you! Designed with your professional advancement and personal goals in mind, the 35 semester hours, seven consecutive semesters, Doctor of Nursing Practice (DNP) program features flexibility with online courses. Alumni Volunteers are Needed in August! On Monday, August 29, volunteers are needed to help at the Mount Carmel Foundation Annual Golf Invitational that provides scholarships for MCCN students. The Invitational is held at Pinnacle Golf Club in Grove City. Volunteers are needed for both morning and afternoon shifts. Lunch is provided for morning volunteers; dinner is provided for afternoon volunteers. To sign up, please contact Kathy Smith by August 1 at ksmith@mccn.edu or 614.234.2230. Let her know what shift you can volunteer and what size shirt you would like to have for the event. Read more: Alumni Volunteers are Needed in August! With more than 170 new professional nurses now answering their life’s calling, and more than 50 master’s degree recipients now practicing at a higher level, the ranks of Mount Carmel Alumni has swelled. See more photographs of our May 5 Commencement ceremonies in the Spring/Summer issue, the Lamp. Other degrees/credentials: I also earned my Bachelor of Science in Nursing (BSN) from Westbrook College (now University of New England) in 1986, and later I was certified in Med-Surg nursing. Professional highlights: For most of my career, I worked at the Maine Medical Center, first in the float pool, then in med-surg intensive care. I became the “patient teacher” for the open-heart patients. I really enjoyed meeting them and their families preoperatively, taking care of them and following them through discharge. For a while I worked in the offices of cardio-thoracic surgeons before returning to MMC in the cardio-thoracic step-down unit until I retired in 2013. Even though I don’t maintain my license in retirement, I keep my hand in by volunteering with the Area Agency on Aging, taking blood pressures and helping with balance assessments and such. Other degrees/credentials: I also earned my Doctor of Nursing Practice (DNP) from Duquesne University in 2013 and my Master of Science in Nursing (MSN) from the University of Phoenix in 2010. Professional highlights: I have been a faculty manager and now am associate professor for Chamberlain College of Nursing’s DNP program. Going to the OSU vs. Rutgers game? Stop by and tailgate with fellow Mount Carmel alumni before kick-off! Location and Time: Yet to be determined – please watch the college website and the Alumni Association Facebook page for updates. Mark Your Calendar: “Homecoming” is October 22!